1. Ms Mica Bhargava, 1987 batch Indian Forest Service officer (IFoS), has been appointed as joint secretary in the department of agriculture, cooperation and farmers welfare in place of Utpal Kumar Singh, 1986 batch Uttarakhand batch IAS. 2. Rakesh Kumar Singh, 1993 batch IDAS officer, has been appointed as additional secretary (joint secretary level), Central Information Commission in place of Ms Achia Sinha, 1982 batch IRTS officer. 3. Sisir Kumar Ratho, 1987 batch Odisha cadre IFoS, has been appointed as joint secretary, National Commission of Schedule Tribes in place of Ashok Pail, 1983 batch IFoS. 4. GK Dwivedi, 1993 batch Andhra Pradesh cadre IAS, has been appointed as joint secretary in the department of land resources in place of Sandeep Dave, 1987 batch Karnataka cadre IAS. 5. Subrata Gupta, 1990 batch West Bengal cadre IAS, has been appointed as joint secretary in the ministry of textiles in place of Ms Anu Garg, 1991 batch Odisha cadre IAS. 6. KR Vaidheeswaran, a Central Secretariat Service (CSS) officer, has been appointed as joint secretary, department of scientific and industrial research in place of Ms G Anupama, 1991 batch Haryana cadre IAS. 7. Praveen Kumar Srivastava, 1988 batch Assam cadre IAS, has been appointed as joint secretary in the ministry of home affairs in place of Raja Punhani, 1991 batch Bihar cadre IAS. 8. 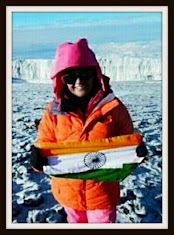 Ms Saheli G Roy, a CSS officer, has been appointed as joint secretary in the ministry of home affairs in place of Satpal Chouhan, 1983 batch IES. 9. Sanjeev K Jindal, a CSS officer, has been appointed as joint secretary in the ministry of home affairs in place of Ms Rakhee Gupta Bhandari, 1997 batch Punjab cadre IAS. 10. CK Khetan, 1987 batch Chhattisgarh cadre IAS, has been appointed as Additional Registrar General (joint secretary level), in Registrar General and Census Commissioner of India under the ministry of home affairs, by upgrading one vacant post of director level. 11. Devender K. Singh, 1989 batch Kerala cadre IAS, has been appointed as Chairman (joint secretary level), APEDA under the department of commerce in place of Krishan Kumar, 1997 batch Punjab cadre IAS. 12. Ms. Maninder Kaur Dwivedi, 1995 batch Chhattisgarh cadre IAS, has been appointed as Advisor (joint secretary level) in NITI Aayog by upgrading a newly-created post of deputy secretary/director in the NITI Aayog. 13. Khushwant Singh Sethi, 1990 batch Tripura cadre IFoS, has been appointed as joint secretary in the ministry of Panchayati Raj in place of Ms Sarada G Muraleedharan, 1990 batch Kerala cadre IAS. 14. 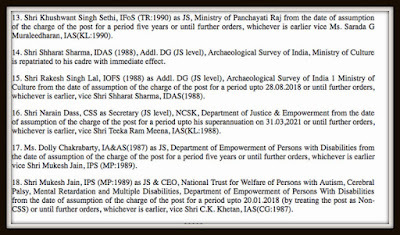 Rakesh Singh Lal, 1988 batch Indian Ordnance Factory Service (IOFS) officer, has been appointed as Additional DG (joint secretary level), Archaeological Survey of India in the ministry of culture in place of Shharat Sharma, 1988 batch IDAS. 15. Narain Dass, a CSS officer, has been appointed as secretary (joint secretary level), NCSK, department of justice and empowerment in place of Teeka Ram Meena, 1988 batch Kerala cadre IAS. 16. Ms Dolly Chakrabarty, Indian Audit and Accounts Service officer, has been appointed as joint secretary in the department of empowerment of persons with disabilities in place of Mukesh Jain, 1989 batch MP cadre IPS. 17. Mukesh Jain, 1989 batch MP cadre IPS, has been appointed as joint secretary and CEO, National Trust for Welfare of Persons with Autism, Cerebral Palsy, Mental Retardation and Multiple Disabilities under the department of empowerment of persons with disabilities in place of CK Khetan, 1987 batch Chhattisgarh cadre IAS. 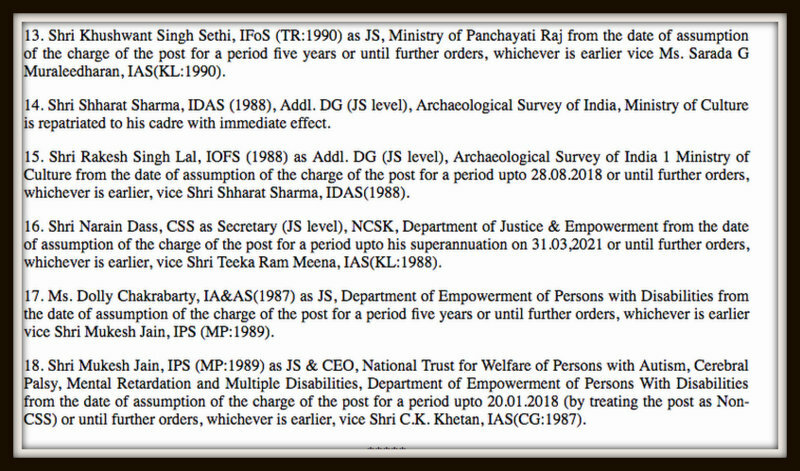 Meanwhile, Shharat Sharma, 1988 batch IDAS and Additional DG (joint secretary level officer), in Archaeological Survey of India under the ministry of culture, has been repatriated to his cadre with immediate effect.